Here in southwestern Florida, where the warm sun shines daily and the white sandy beaches glisten and beckon to be played on, there can be found a very special kind of reef. The map below (adapted from Jaap & Hallock, 1990) shows the different kinds of reefs in Florida and their locations. It must be noted that the habitat distribution is very patchy in each area. In southwestern Florida, the Vermetids are mainly located in the Ten Thousand Islands area, but also extend intermittently along the western coast of Florida as far as Sarasota. However, they are not found in Florida Bay or the Keys, but a small colony has been reported on the old coaling piers at Fort Jefferson in the Dry Tortugas. Some researchers have reported in the literature that they consider the species that are found in the Ten Thousand Islands area are extinct, as the reefs were formed during the last interglacial period that drowned the beach ridges that make up the present-day islands. However, this author has recently found some very small clumps in certain protected tidal areas along the coast. This Vermetid reef is not like an offshore coral reef; it only exists in the intertidal zone, and can be seen only at low tide when it is fully exposed. Well, what is a Vermetid reef? 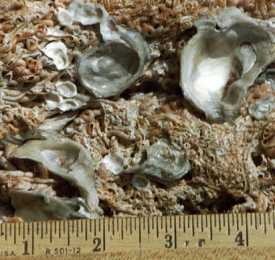 The reef is composed of Vermetid gastropods (a type of marine snail), usually built upon a bed of Crassostrea virginica oyster shells. They are of the family Vermetidae, and the most common species in this area is Vermetus (Thylaeodus) nigricans (Dall). The free-swimming larval juvenile stage has two or three trochoid coils [Fig. above (from Shier, 1969)]. These coils are usually cemented over after the larvae adhere to the substrate. These gastropods are gregarious, colonial, and develop massive structures. 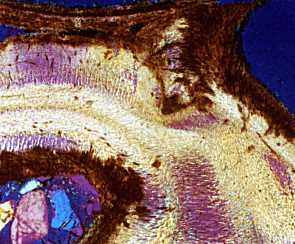 As there are no reported microscopic examinations of these special gastropods, this author decided to have a peek at the microworld composition of this animal in thin section, using blue epoxy under a vacuum to impregnate the sample. 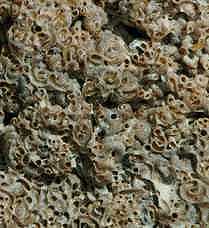 The calcareous tube-like shell of V. nigricans is composed of concentric rings with small fluting on the exterior. It is thought that the fluting adds strength to the structure. 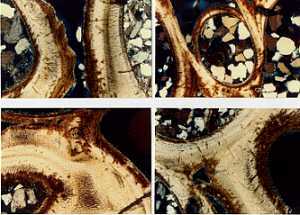 In the adult, the diameter of the tube is about 3–4 mm, tends to be uniform in its length, and grows irregularly without coiling, while the length may be more than 30 cm (Shier, 1969). 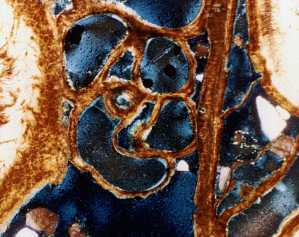 Cross-section of a Vermetid, showing a typical gastropod shell microstructure, with some quartz sand grains at the lower left (the red moon-shaped object at the top left is an air bubble in the blue epoxy) (×160: crossed polars). So, if you ever feel like an unusual vacation to see a special kind of reef, visit the Ten Thousand Islands in southwestern Florida. I believe the National Park service has boat tours out of Everglades City that will motor around the islands, through the swamps, mangroves, alligators, mosquitoes, and wading birds: but bring plenty of bug-spray, suntan lotion, a hat, sunglasses, and plenty of water. Editor’s note: Hugh James Mitchell-Tapping was an American geologist, born on Saturday 11th March 1939, passed away on Tuesday 16th February 2010 in Fort Myers, Florida.